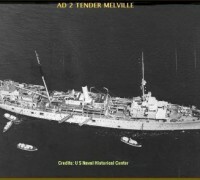 After a shakedown cruise, Pollux operated as a unit of the Service Force, U.S. Atlantic Fleet. She supplied forces afloat and Allied bases at Guantanamo, Cuba; St. Thomas, Virgin Islands; San Juan, Puerto Rico; Trinidad and Jamaica, West Indies; Colon, Panama Canal Zone; Recife and Bahia, Brazil; and Bermuda. She operated out of the East Coast ports of New York, Bayonne, Baltimore and Norfolk.